Terri Flores: Snakes don't eat people. Paul Serone: Oh, they don't? Simply dumb fun, as only 1997 could have delivered. 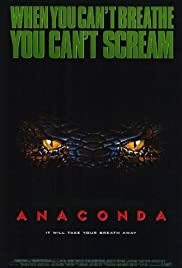 Before there was "Snakes on a Plane," there was "Anaconda," a Hollywood B-movie from the late 90's that is as notorious for its mixed bag of actors as it is for the gruesome snakes that populate its plot. In the film, a group of documentary film-makers traveling through the Amazon jungle picks up a mysterious man who inadvertently becomes their tour-guide on an unexpected detour. It seems the man is totally crazy and intends to capture one of the Amazon's most notorious and deadliest inhabitants: The Anaconda. Despite some bad looking CGI-snakes (not bad in a good way) and a horribly mis-matched cast (J-Lo and Eric Stolz? Really?) "Anaconda" is simply a good, dumb time. Without a doubt, it's an utterly ridiculous film that can be insulting to your intelligence, but thankfully it knows not to overstay its welcome and the 90 minutes it takes up makes for a harmless and amusing ride. Ice Cube plays Ice Cube as he always does, while J-Lo turns in one of her more likable roles. You'll also catch Owen Wilson in one of his earliest roles, and John Voight is a pleasure to watch as he eats up the scenery. But face it, this movie is about snakes, and the titular character is the true star here. Surely, the actors on hand have done much worse, and as far as horror/b-movies about snakes, you could pick up much worse yourself. If you enjoy watching giant snakes (who inexplicably scream) stalk rappers, pop-stars and Angelina Jolie's dad, this is the flick for you. Those seeking genuine thrills, however, may find the film coming up a bit short.